Digital transformation describes creating radically new ways of doing business based on developing technology. Industry changers like Uber, AirBNB, Netflix and others either inspire admiration or strike fear. Could we be “Uberfied”? Could we “Uberfy” our competition? The cool thing about technology is that both of these are worth considering. Technology can be leveraged by anyone, even a startup, to create radical change. It seems risky at best to ignore the potential impact of digital transformation on our current way of doing business. And yet, it seems that few of us truly take advantage of what we might do with technology. We don’t have to look far to see what streaming media like Netflix has done to the traditional video rental store or how Uber and Lyft have impacted the Taxi companies. How will self-driving cars and trucks impact us? What about the automatic checkout at the new Amazon stores? What about IoT sensors that detect the status of machinery and the levels of tanks? You might be thinking, these things won’t affect your business, and maybe this round of changes won’t. But what about the next technology innovation on the horizon? Or, what about a competitor with a better fulfillment system or better analytics, or who uses IoT to monitor their devices, or who just has a better system for product delivery? In 2016, according to Pew Research, Millennials became the largest living generation, and soon they will become the largest spending block in the US. This new generation demands digital transformation. They expect mobile access, immediate response, online service, and everything web. If we look at them as our customer and as our coming workforce we see that we have to keep up with the expectations of a technology driven generation. 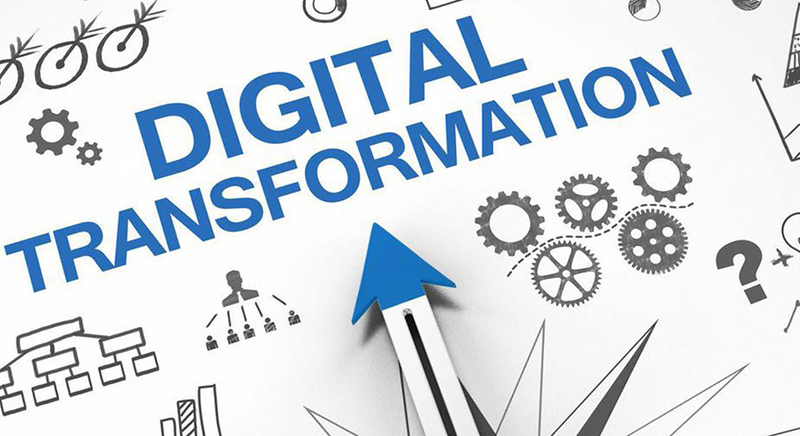 Digital transformation has dramatic results. It allows us to attract new talent and keep them. It creates true efficiency gains that mean we can do more with fewer people. It allows us to grow and scale more quickly because our growth is not always dependent on adding people. It creates a higher level of interaction with customers, vendors, and partners, which in turn produces a better product and a better experience. It makes us a progressive and dynamic company, ready to take on the next challenge or grow to the next level. Digital transformation is often viewed as a single revolutionary initiative as in the case of Uber who revolutionized their industry. However, more often it is brought about progressively by organizations who recognize the need to adapt, grow, and creatively apply technology within their business. Staying the same in our technology driven era is a risky if not deadly position. Creating a blueprint for digital transformation is a grand task. It requires an understanding of your current, future, and even potential customer. In addition, it requires an outlook on technology that includes what is coming. 1. Improving our customer experience. Think about Amazon. They do a great job of allowing orders through the web, mobile, and app. Everything is clear, feedback on delivery is consistent and returns are done easily through a web form. If your customers don’t want this type of communication now, the coming generation will. Ask yourself, how can I in the construction trades, or in manufacturing, or in financial services, offer the same types of self-service and web or mobile access so my customer can get information about their product or their project or their finances at 10:00 PM from their easy chair. 2. Enabling a remote workforce. Many of us have already architected our systems to allow remote workers. With the emergence of the Millennial generation, we will see an even greater push for this. Communicating via chat, text, slack, skype, and other means will become even more important. Antiquated systems that are unconnected will present a challenge as expectations grow for the interconnected and automated enterprise. 3. Eliminating paper and manual workflow. Not only does automated workflow create efficiency, you have to automate your workflow in order to provide web and mobile feedback and self-service. Forms and workflow technology is accessible to almost every business right now, and this is one of the most underutilized and impactful technologies available. 4. Improving analytics. Closely related to automated workflow, many organizations are finding that a next step is to create analytics that give real-time insight into the efficiency of their operations and allow better and more responsive adjustments to their operations and even their business model. Analytics are the next evolution in automating workflow. 5. Implementing IoT. The Internet of Things is the application of wireless sensors to track and report on device status, production, or even needs for service. What might these sensors mean to your business? Could you track construction equipment, status of a production line, fuel levels, delivery vehicles, or something else? IoT is an available and affordable technology that can produce huge results for many organizations. 6. Integration of applications. I find that most of the organizations I work with have disparate systems that have their own silos of data. Their accounting system does not talk to payroll entry or to their ERP. Their construction system and their estimating system don’t pass data between them. CRM does not work with the financial management tool. This is low hanging fruit. Improving these systems, or integrating them produces daily productivity gains and allows for increased transparency and better reporting. 7. Watch these emerging technologies. Artificial intelligence is developing quickly. Consider self-driving cars and trucks, deep learning technology, bot based customer service, and other AI initiatives. IBM is betting huge on AI and their bet looks good to me. Augmented reality is emerging rapidly as well. While it may look to many like a computer gaming thing, its application is much broader. Clothing companies are considering how they might use AR to allow people to virtually try on clothes. You may be able to virtually walk through a vacation destination before buying. You may be able to use VR to walk through your new house before it is built. The possibilities are endless. In a recent interview on CNBC, tech entrepreneur, Mark Cuban espoused his belief that the next 10 years would hold “the biggest technological revolution we have ever seen”. This, and the rise of the millennial generation, make taking initiative with a digital transformation of the highest importance for every organization.